Happy Card Making Day, eP Friends! I’ve been having fun playing with all the Dylusions Ink Sprays and Dylusions Cling Stamps in my art journal but since today is World Card Making Day, I wanted to share a card which used both in creating my card. I know that the first thought that pops into heads when mentioning Dylusions Ink Sprays and Dylusions Cling Stamps is art journaling, tags, or mixed media. 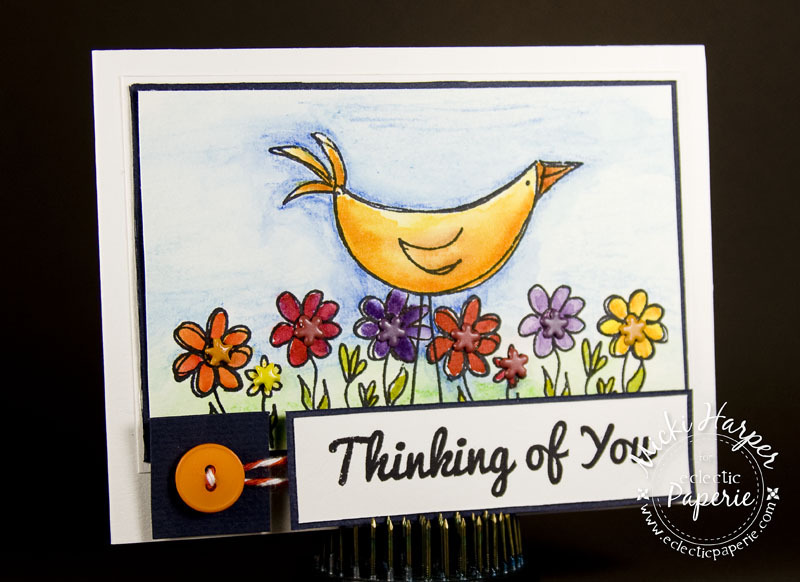 Which these are wonderful for, however, both the ink sprays and the stamps are wonderful for creating just cards. As much as I like color, I also love a clean and simple style and lots of white space. I mean, how can one go wrong with that combination, right? Whenever I can't seem to get a card to come together, this is what I fall back on. I used the large bird and the flowers from Dylusions How Does Your Garden Grow set, stamped onto watercolor paper with StazOn Jet Black ink. I spritzed the Dylusions Ink Sprays onto my Non-Stick Craft Mat and using the Tim Holtz Water Brush - Detailer, colored the images. For the sky I used the broad nib Tim Holtz Water Brush. Using a paper towel to pick up any excess ink and to create a bit of texture. I did this a lot on the sky which really makes the texture of the water color paper come through. 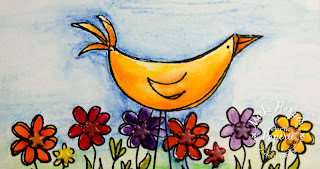 It's personal preference, but when I watercolor I want my projects to look like they were water colored. Which is why I love the 'un-eveness' for lack of a better word. The sentiment is from the Big Greetings stamp set from Market Street Stamps. When I first spotted this set in the shop, I knew I had to get these. One can never have too many greetings and I love the size of each of the greetings. They stamp like butter!!! I used Scotch Foam Mounting Tape to pop the sentiment panel up a bit. To cover up a 'boo-boo' in the lower left hand corner of the card (which always happens when my project is 99% complete, sigh) I added an orange button from Buttons Galore with twine from The Twinery. I absolutely love how this card turned out. I love the vibrant colors achieved by using the Dylusions Ink Sprays and a Water Brush. Dylusions How Does Your Garden Grow stamp set is a wonderful line art set - perfect for Copics, or any coloring medium you choose. And in honor of World Card Making Day, eclectic Paperie is having an awesome sale on select items. Stamps, 6x6 paper pads, embellishments and more. Details below or you can head over to the shop and check it out! 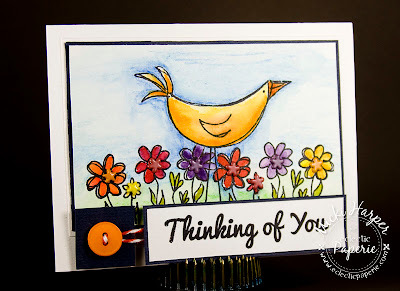 But that's not all...Post your creation in our World Making Card Day 2012 Album on eP's Facebook page and be entered in to a random drawing for a $25.00 eclectic Paperie gift certificate! You have until October 8th to enter a card and the winner will be announced on Tuesday, October 9th! Want to see what some of the other members of the eTeam are up to today? Visit the links below! Thanks for stopping by and I hope you get inky! Love these bright colors, Broni! A wonderful combination and a beautiful card! Love it! Wishing you a happy day!